Forceful at times and tearful at others, Obama’s valedictory speech in his hometown of Chicago was a public meditation on the many trials the US faces as Obama takes his exit. For the challenges that are new, Obama offered his vision for how to surmount them, and for the persistent problems he was unable to overcome, he offered optimism that others, eventually, will. 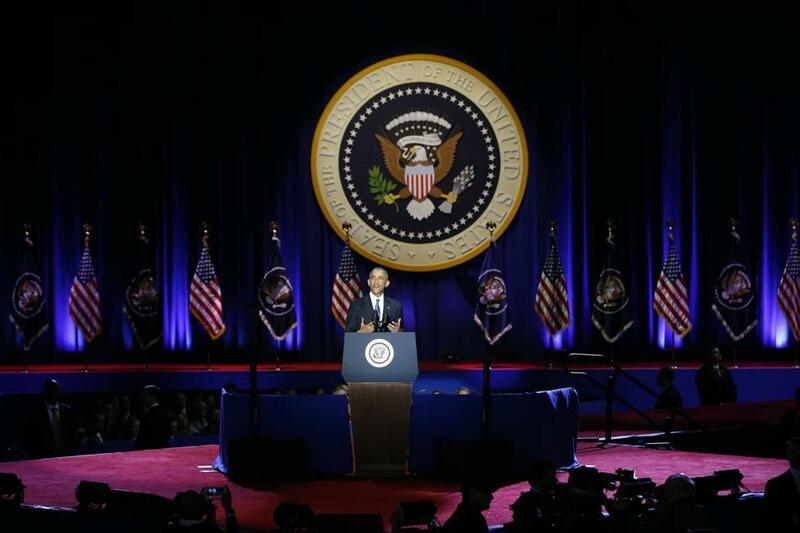 President Barack Obama delivered a forceful, yet emotional, farewell speech in Chicago on Tuesday night. He pushed back on the isolationist sentiments inherent in Trump’s trade policies. He decried discrimination against Muslim Americans and lamented politicians who question climate change. And he warned about the pernicious threat to US democracy posed by purposely deceptive fake ‘‘news’’ and a growing tendency of Americans to listen only to information that confirms what they already believe. Get out of your ‘‘bubbles,’’ said the politician who rose to a prominence with a message of unity, challenging divisions of red states and blue states. Obama also revived a call to activism that marked his first presidential campaign, telling Americans to stay engaged in politics. ‘‘Such a vision, however well-intended, was never realistic,’’ Obama said, though he insisted race relations are better now than a few decades ago. 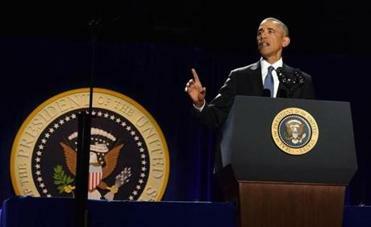 President Obama spoke Tuesday in Chicago. ‘‘You'll soon outnumber any of us, and I believe as a result that the future is in good hands,’’ he said. Lederman reported from Washington. Associated Press writers Ken Thomas and Calvin Woodward in Washington contributed to this report.